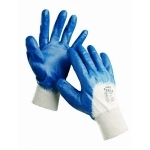 Work gloves to protect hands from cuts, impacts, chemicals, high or low temperatures. 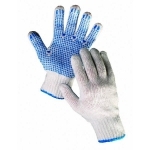 Disposable gloves, knitted gloves with different types of coatings, leather work gloves, chemicals resistant gloves or gloves made of such materials as Kevlar, Nomex, Dyneema or TAEKI can be used depending on the kinds of working tasks performed. Work gloves to protect hands from mortal danger industrial risks undergo mechanical strength tests according to EN388 standard. 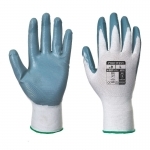 Depending on the tests results received protective work gloves are marked by the EN388 pictogram and the sequence of 4 figures where the first one means resistance to abrasion, the second - blade cut resistance, the third - tear resistance, and the forth - puncture resistance. 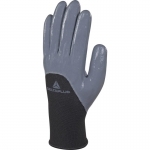 Out of the total volume of personal protection equipment purchased by industrial enterprises work gloves share is the biggest. 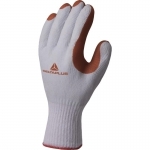 Unfortunately, one of the surveys conducted in the European Unity revealed that about 70% of consumers were not using the most effective work gloves for the task. And about 50% of glove consumers could not explain what had urged them to buy the kinds of work gloves they were using. 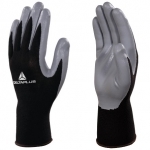 Depending on the kind of work activities and working conditions it is necessary to choose certain work gloves able to provide an adequate level of hands protection. 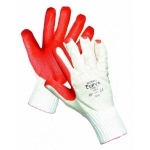 Information on materials used for gloves production (cotton or nylon knitted, polyester with PU or nitrile coating, leather, heat resistant split leather, nitrile, latex, neoprene, Kevlar, Nomex, TAEKI) and products marking to the relevant standards maybe useful at the first stage of such selection. The product’s marking can give an idea about gloves resistance to abrasives, cuts, punctures, tearing, low or high temperatures influence. 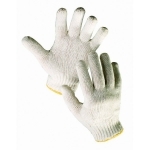 It is possible to evaluate gloves ability to protect hands from water, microorganisms or different chemicals. 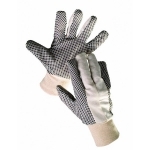 The following step is to buy samples of chosen work safety gloves and to test them in real working conditions. 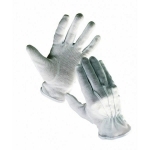 Criteria for the evaluation of the tests conducted shall include protection effectiveness, work gloves safe usage time, comfort and touch sensitivity while performing the work tasks. 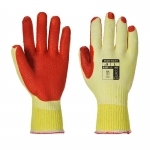 Work gloves selection process is based on the gloves ability to provide the necessary protection while insure optimal balance of cost and usage effectiveness. 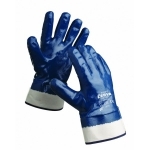 Having chosen the best work gloves the company can purchase them in bulk and carry out full scale tests. 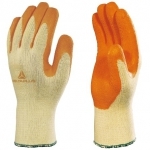 Any work process changes will force to review the assortment of safety work gloves used. 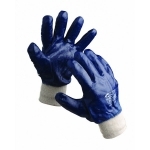 Wide assortment of protective work gloves, made of leather, knitted fabric, latex, nitrile and other materials, provides the possibility to select the right means to protect hands form risks of abrasive injuries, cuts or punctures, penetration of water, chemicals or biologically active materials, low or high temperature influence, burns caused by contacts with open fire or molten metal. 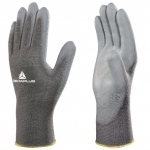 We can help to choose working gloves with optimal characteristics for safe and productive work. Our products portfolio includes high quality products produced in accordance with the current European and Ukrainian safety standards. 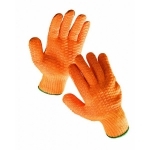 You can turn to Ukrprofzahyst to buy work gloves and get expert opinion on safety gloves usage. 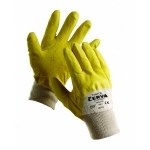 Ukrprofzahyst internet shop offers high quality work gloves produced by European companies Delta Plus and Cerva. You can order and purchase hands protection products in retail or wholesale quantities with delivery within Kyiv and Ukraine.